Okay. I’m really excited about this. As a parent of a young child, we go through a LOT of markers. I’ve done so much Google research on what to do with dry markers because it makes me feel awful about throwing them out. Well! My prayers have been answered with this new Terracycle Brigade, a partnership with Staples and Newell Rubbermaid. 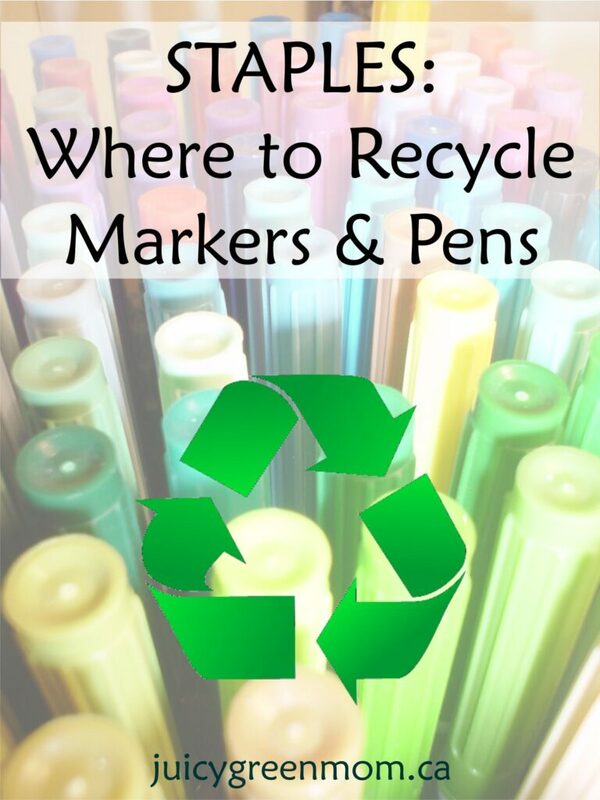 Now I can tell you where to recycle markers and pens, Canadians! Staples! The Terracycle Brigade page has a search box where you can enter your postal code to find a Staples location near you that is participating in this awesome program. How cool is this? I’ve got a huge pile in a reusable bag that I’m bringing to recycle at my next visit! UPDATE: I’ve now heard that CRAYOLA will pay for shipping used markers for recycling in the US and in some parts of Canada now! Check it out! What do you usually do with your used writing utensils? I really hope this moves into the US. I love this idea! I hope so too! Terracycle obviously needs to have funding from companies to run these programs, but if this program in Canada goes well, maybe Newell Rubbermaid will do a brigade in the US too! Living in Oregon, I don’t have the same resources, and Staples is not doing a take back program here. So, we try to stay within the parameters of what can be reused or recycled here. for instance, we use a permanent marker to label clothing, to address packages to be mailed and food packages put into the freezer, and home canned foods as to variety and date canned. otherwise, we mostly use crayons, as they has so many uses and the stubs can be easily melted down and remolded. I have, for example, a small star shaped chocolate mold. melting a couple crayon stubs in it results in a five-pointed crayon swirled in two colors. fun to use, easy to hold, and uses up something that might otherwise be wasted. Crayons are so wonderful, aren’t they?? That is so awesome that you have been so diligent about sticking to using them. I have to admit that I had a moment of “caving in” when my daughter discovered markers at another friend’s house and loved them – so I didn’t say no when she asked for them later. Hence now we have those bloody plastic markers! I applaud you for your perseverance and better self control!! When we were in Canada for a short visit, we were amazed with how diligent you all are with separating EVERYthing for recycling. I remember seeing an advert about recycling plastic on the train. We have a LOOOOONG way to go over here. That is so encouraging to hear!! Thank you! !